Donna Summer has been around for such a long time, that many of her singles are still wellknown. From her output in the Eighties, 'State of independence' is quite probably her best known song. The track was originally written and recorded by Jon Anderson & Vangelis on their 1981 album 'The friends of Mr. Cairo'. Donna Summer recorded her version a year later on her 1982 self-titled album, with Quincy Jones producing. Her version of the song features an all-star choir including among others Michael Jackson, Brenda Russell, James Ingram, Dionne Warwick, Kenny Loggins, Lionel Richie and Stevie Wonder. Upon its original release, it became a number 1 hit in the Dutch Top 40, peaking at number 14 in the UK singles chart and number 41 in the US Billboard Hot 100 chart. Remixes were released in 1990 and 1996. When Barry Gibb is producing, or even co-producing, any song takes on a decidedly 'Bee Gees sound'. 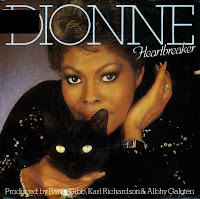 So when Dionne Warwick had her 1982 album 'Heartbreaker' co-produced by Gibb, it was almost as if she was doing backing vocals to Bee Gees tracks. Warwick later commented that she didn't like the album's title track, but recorded it because she trusted the judgement of the three Gibb brothers, who wrote the song, that it would be a hit. And it was: Warwick reached the charts all over the world when 'Heartbreaker' was released as a single. It reached number 5 in the Dutch Top 40 and number 2 in the UK singles chart. Warwick commented: 'I cried all the way to the bank'.